A bit over 5 years ago I first learned about wicked problems. So I looked at the oft-cited seminal article by Rittel & Webber of 1973 and tried to make sense of it (see old post). There was a lot of information in the article, which made it a bit confusing. The most often quoted part of the article is the list of ten characteristics of wicked problems. These ten points seem to be clear to most people, but to me it remained a bit cryptical. Time for a second effort. I will make use of a second paper by Rittel entitled ‘On the planning crisis’ of 1972 (presented 1971). The reader must bear with me, because both papers are very long (on average over 8240 words each), rich and profound. I am pretty sure the essence of Rittel’s work has been properly condensed now. Here we go. Tame and wicked problems There are two types of problems, tame ones and wicked ones. Tame or benign ones belong to the world of play (e.g. chess) and academia (e.g. mathematics, organic chemistry). Wicked problems belong to the real world, with the realm of public policy often used to provide appealing examples (e.g. location of a freeway, the adjustment of a tax rate, the modification of school curricula, or the confrontation of crime). So, building a freeway is not a problem, buy locating it is! The same with urban renewal. Building new houses is fairly straightforward, but their scale, location, design, financing, and the whole socio-economic embedding is not. And neither is the effectiveness! (There is a bit of hyperbole in this paragraph. Allow me to admit that tame problems also belong to the real world. It is just that wicked problems first have to be tamed for that to be so, and even then they will retain a high degree of wickedness anyway. 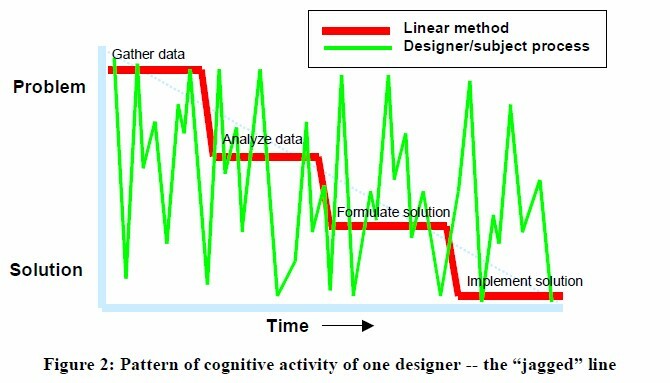 See ‘pattern of cognition’ below). Rittel’s first discovery …. was that professionals are trained to solve tame problems of all sorts, but all of these tame problems may have contextual complexities that often turn them into wicked problems. The second discovery – probably under the influence of Churchman, just like the first one – was that wicked problems are in need of approaches that are totally different from the methods applied to tame problems. These approaches are commonly known as problem structuring methods. 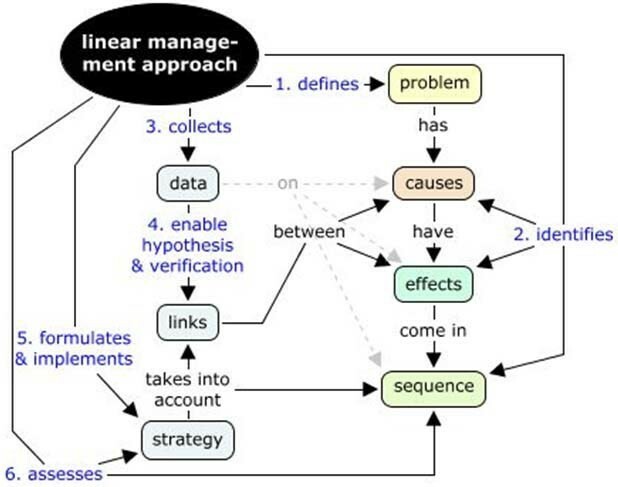 Tame problems are structured problems, which makes them amenable to linear management (Mascarenhas 2011). In 2013 I produced a useful concept map of the conventional, linear approach to solving tame, structured problems. Tame characteristics For a linear approach to work or for a situation to be considered as non-wicked, the problem at hand must satisfy a number of characteristics. For the problem to be defined, (1) all the necessary information (data) to do so must be available in some way. Next, tame problems must meet a number of criteria to be able to ascertain that (2) a solution can be found or (3) the solution can be considered to be correct. After implementation (4) an adequate test must available to be able to ensure that the solution is a success. Alternatively, if we cannot design a solution with certainty, (5) it must be possible to use a trial-and-error approach (e.g. as in pilot projects) to find a correct solution. This presupposes that trial-and-error efforts do not irreversibly and importantly alter the original tame problem. If none of these approaches work, we may be able to (6) enumerate a full set of potential solutions or operations to allow us to use our judgment to pick the best one. If that, too, does not work, the problem at hand may be (7) similar to other tame problems already solved using a particular set of techniques, which we could then apply. The last three characteristics are highly interrelated. Tame problems normally can be assumed to have (8) clear boundaries so as to allow them to be treated separately from other problems. Tame problems may also exist when (9) it is possible to refute causal hypotheses or when – as in science – (10) it is admissible or encouraged in principle to refute hypothesized solutions. 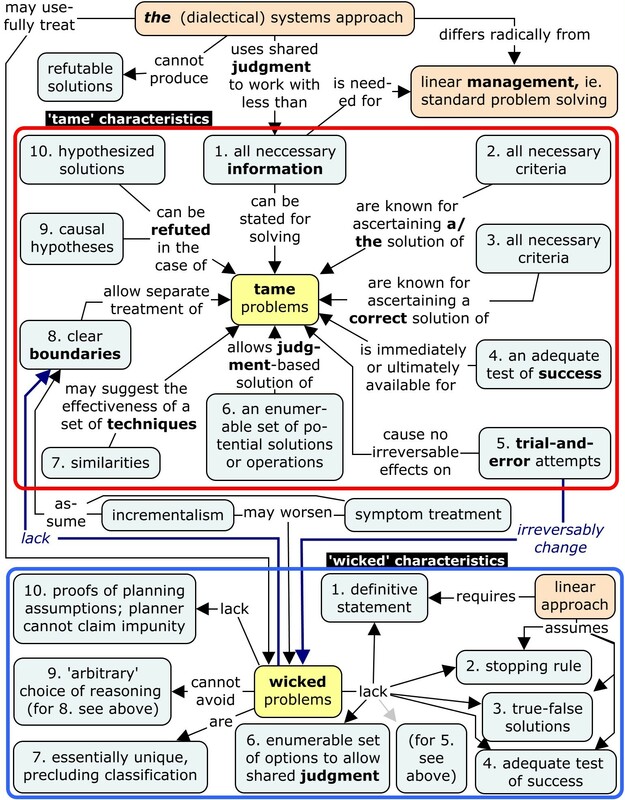 Wicked characteristics Rittel has formulated ten characteristics of wicked problems that contrast with the ten tame characteristics above. Wicked problems (1) cannot be exhaustively formulated (not only is not all information available, but the information needed to understand the problem also depends upon one’s idea for solving it); (2) lack a stopping rule, because there are no criteria for sufficient understanding and because there are no ends to the causal chains that link interacting open systems); (3) there is no true or false understanding or solution, only better or worse, the judgment of which depend on one’s values or ideological leaning; (4) lack an immediate or ultimate test of success (consequences extend over virtually unbounded space-time); (5) every solution is a one-shot effort (e.g. investments cannot easily be undone, precluding an trial-and-error approach); (6) lack an enumerable set of options to allow shared judgment (the alternative is to dress a plausibly exhaustive list); (7) every problem is essentially unique, because superficial similarities are deceptive (part of the art of dealing with wicked problems is the art of not knowing too early which type of solution to apply); (8) lack clear boundaries, so every wicked problem can be considered to be a symptom of another problem (see next paragraph); (9) have many explanations for the same problem (argumentation is much richer than allowed in science); finally, (10) the problem solver has no right to be wrong, because real people are affected. This is unlike science, where refutation is an important principle (Popper 1961). Pattern of cognition Rittel wrote in 1972 that one “cannot separate the generation of solutions from understanding the problem.” This follows from characteristic nr. 1. Rittel went on to write that one “can play this [i.e. iteration] with all steps of the first-generation approach”. A student of Rittel, Jeff Conklin (2001), used an amazing graph illustrating this very important cognitive phenomenon, which was studied in detail by Guindon (1990). Conklin adds that “this non-linear process is not a [mark of stupidity], but rather the mark of an intelligent and creative learning process,” especially in the case of novel, complex problems. The original study (Guindon 1990, Knowledge exploited by experts during software system design) underpins the need for a more dialectical approach to problematic situations. The dialectical systems approach … was designed – although perhaps not originally – to deal with wicked problems. However, Churchman, who developed the dialectical systems approach, never wrote explicitly about wicked problems in his trilogy (1968, 1971, 1979). 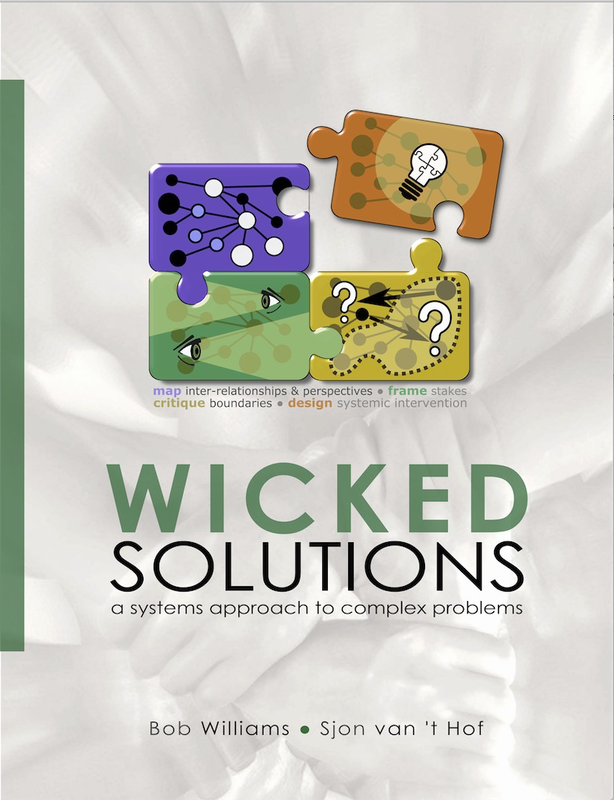 But Rittel, who developed the concept of wicked problems, did write explicitly about the dialectical systems approach (or “second generation systems analysis” as he calls it) as a useful way of treating wicked problems. Rittel concurs with Churchman that there are no experts in the systems approach, because key scientific conditions for dealing with problems as if they were tame do not exist in the case of wicked problems. “The expertise and ignorance is distributed over all participants in a wicked problem” (Rittel 1972, 394), a clear reference to Churchman’s principles of deception-perception (Churchman 1968, 231). “If experts there are, they are only experts in guiding the process of dealing with a wicked problem, but not for the subject matter of the problem.” In Rittel’s mind, a “systems approach of the second generation” must: (1) maximize involvement of all participants in a wicked problem; (2) make the steps in the planning process transparent and communicable; (3) make the value basis of each person’s judgments explicit in an argumentative process of deliberation; (4) make the argumentative process more powerful and bring it under better control; and (5) distinguish between (first-order, second-order etc.) partial judgments and overall judgments in the argumentative process without losing sight of the limits to rationality (Rittel 1972, 396). Some of these ideas have been incorporated in my post “Resolving wicked problems: rules of the game”. Rational paradoxes Rittel (1972, 391) argues that science cannot successfully apply its principles and ideas in the context of practical planning problems, corporate or otherwise. The fundamental reasons against using “systems analysis of the first generation” are four deep lying paradoxes connected with the concept of rationality, defined here as rational behaviour to try and anticipate the consequences of contemplated actions: (1) tracing these consequences is itself a consequence (cost, time) that needs to be considered ad infinitum, so “there is no way to start being rational”; (2) every consequence has consequences ad infinitum, so there is no way to end being rational; (3) the longer the chain of future consequences (or past causes) the more they become uncertain; (4) the consequences are traced using a model, but who determines which model to use? This question becomes particularly important in the case of wicked problems if we know that all essential planning problems are wicked. Hidden in these paradoxes is a very interesting phenomenon. Incrementalism vs. leverage It follows from characteristic nr. 8 (as well as rational paradox nr. 3) that the level at which a wicked problem is settled depends upon the judgment of the planner(s) with regard to the key causal explanation. The higher the level of a problem’s formulation of a problem’s formulation, the broader and more general it becomes and the more difficult it becomes to do something about it. On the other hand, one should not try to cure symptoms (‘symptom treatment’ in the concept map), which is what one risks doing at too low a level of the problem’s formulation. The same applies to ‘incrementalism’, i.e. moving policies in small steps in the hope of improvement (Lindblom, 1959). What this generally does achieve is entrenchment, which leads to more small steps in the same direction, even when the situation is getting worse. This is the ‘easiness vs. effectiveness’ argument, which I explained in my post on Dana Meadows’ Twelve leverage points for systemic intervention design (Meadows, 1999). One of the secrets to dealing with ‘wicked problems’ is that they are not actually ‘problems’. In order to avoid paralysis one needs to move to another station point—like moving from a geocentric to solar centric stance to make sense out of the orbits of the planets. Rittlel chose politics and debate to make sense of ‘wicked problems’. I chose systemic design under the influence of systems scholars and design practitioners. Your post is an invaluable step in making your own move. Thanks for your comment. My ‘move’ is to write an accessible theoretical companion to Wicked Solutions. I started writing last year, but it didn’t go well. I started again a little while ago and hope to finish early next year. The need for writing the present post came up while working on chapter 2, which is about wicked problems. Rittel too doesn’t look at them as problems, but rather as dilemma’s. In the UK people seem to prefer ‘problematic situations’. The notion of ‘analysis paralysis’ is a useful one. Thanks again. Reblogged this on the once-chosen path.